Crawley skip hire services, Fastway Skip Hire is a company with years of experience in waste disposal and with a wide retention of high quality service to our customers. We are dedicated in providing the best quality skip hire services across Surrey and West Sussex this has helped us retain customer confidence over the years..
As a skip hire company in Crawley we have fierce competition but years of top service and pricing has made us the most renowned and trusted amongst skip services available in the area. Our skip services team provides waste disposal skips to Crawley businesses and is the skip hire company of choice amongst the local community. Crawley Fastway Skip services is most preferred service during renovations and new builds of homes and businesses. When there is need for responsible disposal of unwanted items and waste, and refurbishing offices and shops or carrying out a large scale industrial project with residual construction waste. 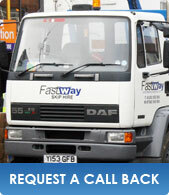 Fastway skip services have useful resources and equipments to carry out safe, and secure disposal of any refuse. Get affordable quotes for any size of skip you may require, choose us and we will make sure you receive the best value and service. Disposal of unwanted waste Skip hire services of Crawley.